Hello Doodlebugs! 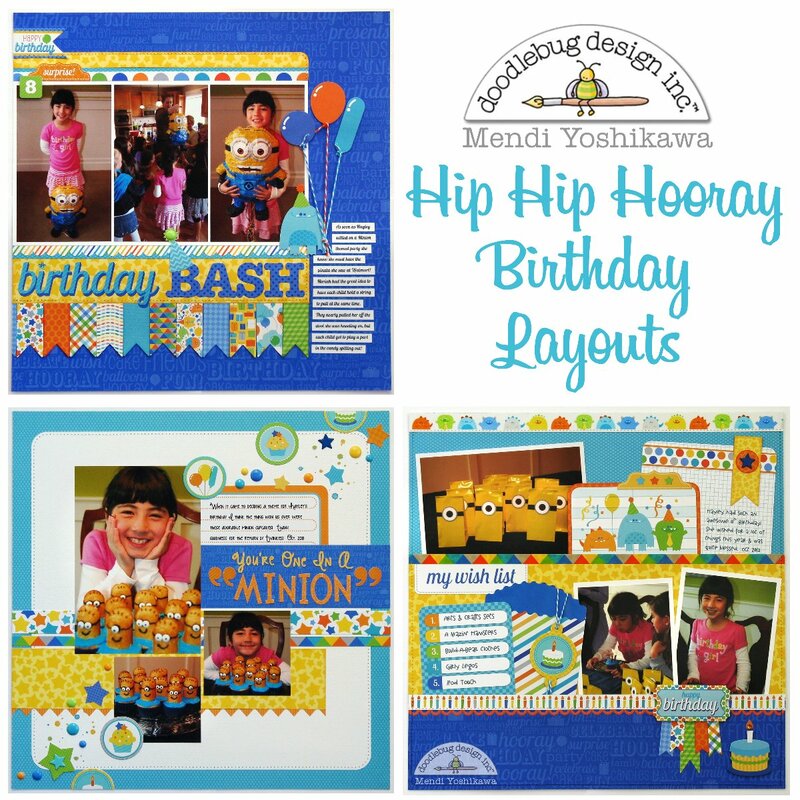 It's Mendi here and I am so happy to be sharing some layouts with you today using Doodlebug's new Hip Hip Hooray Collection! I adore the bright and cheerful colors in this fun line! 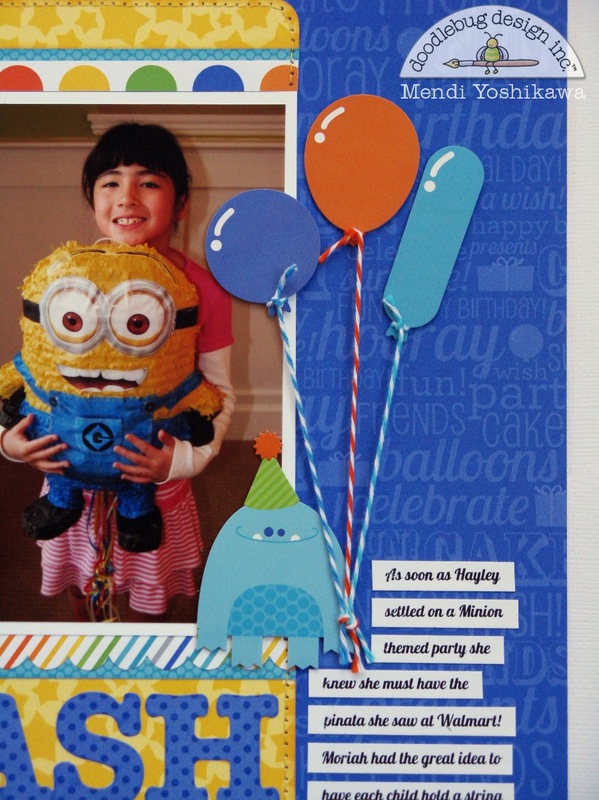 I actually don't have boys, but I thought the colors were a perfect match for my daughter's recent "Minion" themed party. 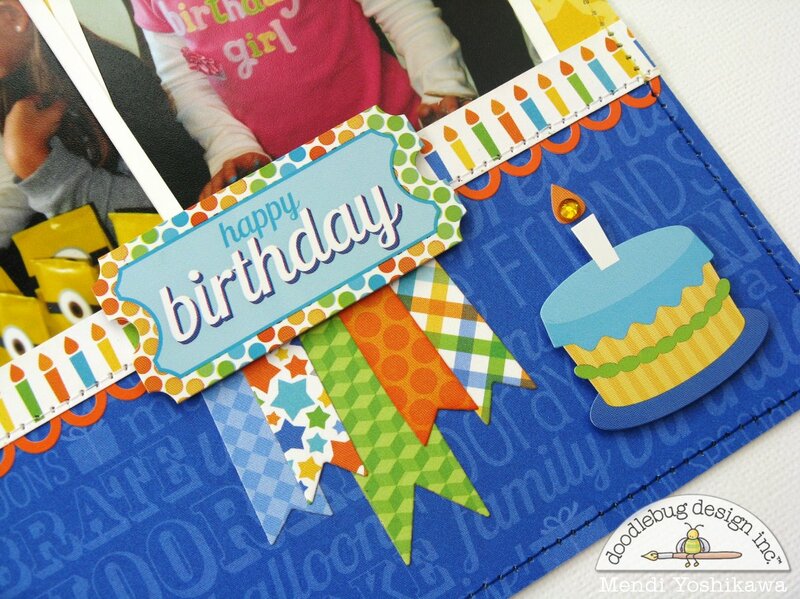 First up I have a layout featuring a border of pennants to show off all the yummy prints in the 6x6 paper pad. For my embellishment focal point, I popped up the balloon icon stickers with foam tap and "tied" them to the monster sticker with twine. I combined Doodlebug's "birthday" phrase from their icon sticker sheet with a die cut title using some matching petite prints paper. To add a playful feel to my title I added the birthday hat sticker to my Letter "B" and dotted my "i" with a star rhinestone. I was on a roll and thought it might be nice to keep the birthday looking somewhat consistent in my album so I went ahead and created a couple more layouts to share with you. For my next one I wanted to recreate the look of party confetti by mixing dripped spray mist, doodle sprinkles, star brads, star stickers and circles punched from the Hip Hip Hooray Pixies set. I printed my journaling on a Hip Hip Hooray Simply Put Album Insert and made my title using Tangerine Shin-Dig Sugar Coated CS Stickers paired with a Silhouette cut subtitle (font: KG Strawberry Limeade). For my last layout I wanted to do something with a twist on the popular pocket page trend and create my own pockets from patterned paper. After adhering my 12-inch wide pockets across the page, I stitched around the three sides of my layout and set to work filling the pockets. I love finding fun ways to use the Simply Put Album Inserts on traditional layouts and cards and this style of page is perfect for that. I dressed up the inserts with strips of patterned paper, stickers and brads after running one of them through my printer for my journaling. I cut apart the 6x4 wish list card from the set to be a smaller 3x3 card. To emphasize the treat bag theme in my photos, I took one of Doodlebug's Treat Bags and tucked it in my pocket, wrapping it with twine and another one of the tags found in the pixie set. I finished off my layout using a ticket sticker layered with some more pennants. I love carrying little bits of each page over into the next to create a cohesive look. Every single one of your layouts are FABULOUS Mendi!! 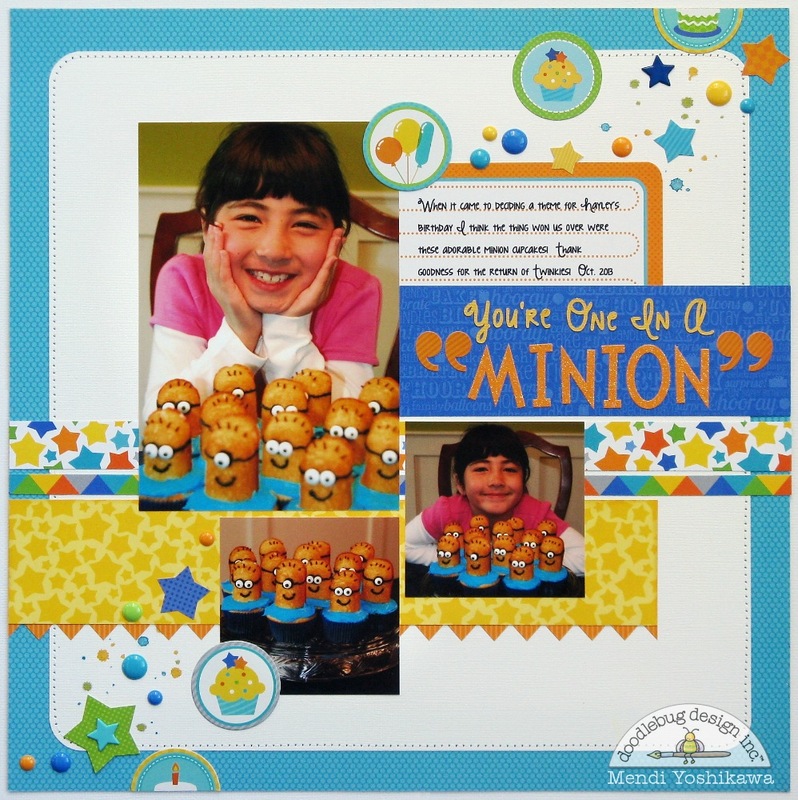 Great use of the Hip Hip Hooray collection! Fabulous work Mendi! I am glad to see another fan of Scrapbook Generation Sketches! I love them too! 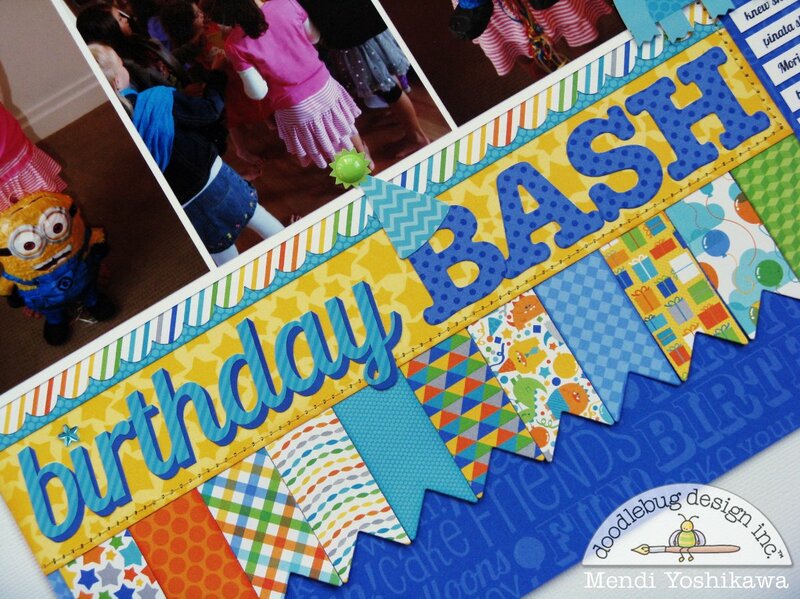 You were so wise to use this collection for your party pictures, Mendi! I love the colors and the monsters! They are perfect! I've pinned all three layouts! Very fun layouts! I love how the papers are used! I pinned the layouts! Fabulous work with this collection! And I love your party theme and decor!! Shares these fab layouts on Facebook! Cute! I love the minnion theme! I shared on Facebook. So bright and colorful. Love them. These are fabulous! 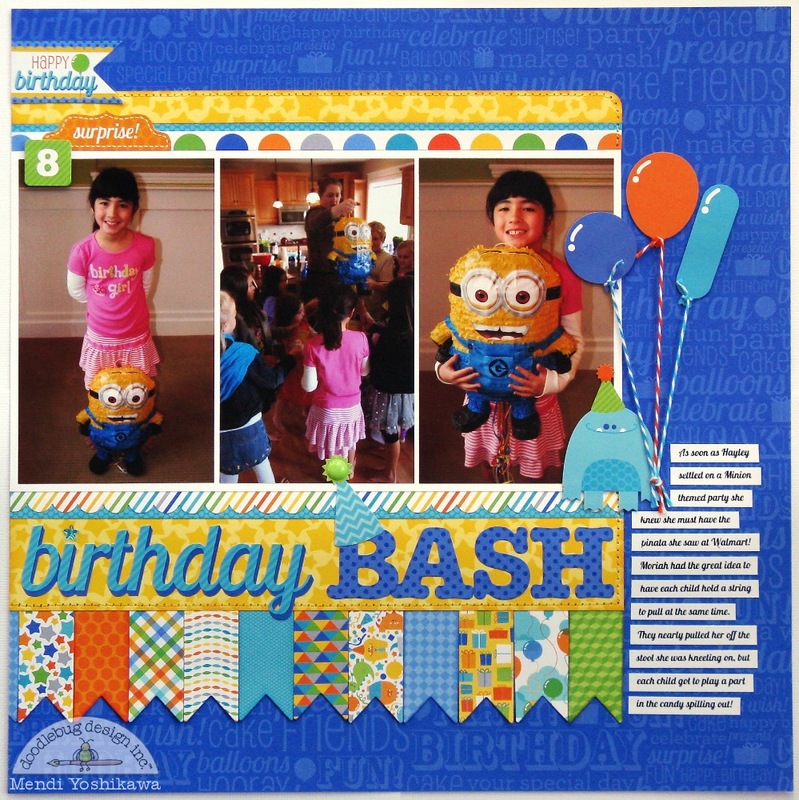 What a great collection for party themes. Adorable photos and layouts. Love how versatile this collection is for a girl or boy. Beautiful layouts! I love the layering and stitching, thanks for sharing. Love all of the birthday memories scrapbooked in these layouts! All of the pages look fabulous, love all of the details! I love this layout! Ipinned to my scrapbook pages board on Pinterest? there is so much detail with these, just amazing.